and Javier Navarro, executive chef at STACKED. Huntington Beach, CA (Restaurant News Release) With an eye on capturing the big prize at this year’s Fourth Annual San Diego Mac n Cheese Fest, STACKED: Food Well Built collaborated with renowned culinary artist Chef Bill Bracken for a craveable recipe that won the hearts and stomachs of mac n cheese lovers. Taking the People’s Choice for its Southwest Chorizo Mac, STACKED is now adding this dish to its menu for a limited time only, with a portion of the proceeds to support Chef Bracken’s charitable efforts to feed those in need. This isn’t the first collaboration between Chef Bracken and STACKED. Bracken worked with STACKED’s culinary team when the restaurant first opened in 2011, helping to develop signature sauces and dishes that STACKED fans have come to crave. Chef Bracken’s Southwest Chorizo Mac combines pasta with STACKED’s popular house made cheese sauce, chorizo, goat cheese, caramelized onions, tasty herb roasted tomatoes and mushrooms. In 2013 Chef Bracken left the corporate world to found Bracken’s Kitchen, allowing him to use his culinary skills to help and nourish those less fortunate. Today, thanks to community support and restaurant donations that also help reduce food waste, Bracken’s Kitchen operates a mobile kitchen that provides delicious meals to thousands of people with dignity. Beginning today, STACKED will be offering the award-winning Southwest Chorizo Mac n Cheese at all locations with $1 of each order going to Bracken’s Kitchen. For every dish of this special mac n cheese sold, Bracken’s Kitchen will be able to serve three meals that include a freshly prepared entree with a salad and vegetables. 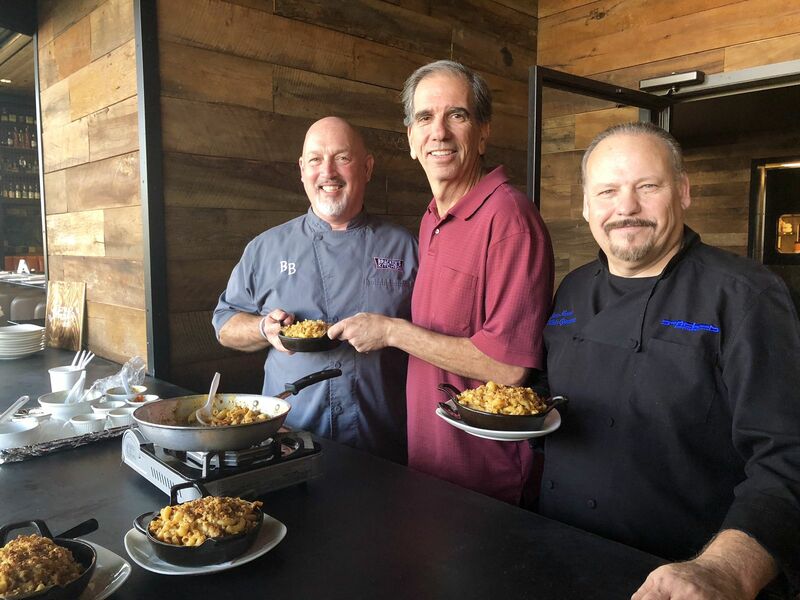 “It was exciting to work with Chef Bracken again and take home the top honors for the Southwest Mac n Cheese. Now our fans can help us help Bracken’s Kitchen by enjoying this delicious dish,” said Paul Motenko, STACKED co-founder and co-CEO. “It was an honor to come together again with Paul and his team to work on the Mac n Cheese competition to create an award winning dish. Beyond my love of Stacked and their concept I have always been so impressed with the work that Paul has done to give back and support a lot of worthy causes. To have him in our corner is truly a blessing,” said Chef Bill Bracken. STACKED: Food Well Built is a full-service restaurant serving premium-quality, inventive and flavorful American favorites, where tablet technology serves as a platform for customization of incredible appetizers, burgers, pizzas, salads, sandwiches, mac ‘n’ cheese, shakes and desserts. Guests become culinary architects, building their meals exactly the way they want choosing from dozens of fresh ingredients and flavorful house-made sauces. Besides facilitating customization, the innovative ordering approach also lets guests control when they order and pay. And, it gives STACKED team members more time to deliver a greater level of hospitality than in a traditional, full-service restaurant. STACKED also offers a full-bar, replete with multiple, flat screen TVs, and stocked with rotating craft beers, premium wine selections, and top shelf liquor for inventive cocktails. STACKED: Food Well Built was founded in 2011 by the former co-CEO’s of BJ’s Restaurants, Paul Motenko and Jerry Hennessy, who developed that brand into a national chain. STACKED has restaurants in Torrance, Cerritos, Thousand Oaks, San Diego and Huntington Beach. For more information about STACKED or employment opportunities, visit stacked.com, facebook.com/stackedrestaurants, twitter.com/foodwellbuilt, or instagram.com/foodwellbuilt. Bracken’s Kitchen is the inspiration of Bill Bracken, a nationally renowned chef with over 35 years of experience in the hospitality business. After graduating with honors from the Culinary Institute of America, Bracken began what was to be a long and successful career with a number of acclaimed hotels and restaurants and eventually opened the DivBar in Newport Beach, a way to connect his love of good food with an entrepreneurial spirit. He later became involved in a variety of nonprofit work, including volunteering his services to the Orange County Rescue Mission as a regular guest chef. It was Bracken’s work at the mission that reconfirmed his concerns about the significant levels of food insecurity that exist within Orange County, and he set about to find a way to leverage his talent, experience and connections to make a difference and feed the hungry. Bracken’s Kitchen is a 501(c)(3) organization based in Orange County California. Founded in 2013 their mission is simple: Through food recovery, culinary training and our community feeding program we are committed to recovering, re-purposing and restoring both food and lives.